Welcome to the Individual Exercises section of the Toolkit! This section includes exercises for you – and possibly your friends and colleagues! The exercises will foster your reflection on tolerance, empathy and other personal features that make it easier to understand the needs and problems faced by persons who are or feel to be excluded. The exercises can be performed on your own, but can also be used to start a discussion with your friends and colleagues, not only on the topic of social inclusion, but also on your personal characteristics and how they can affect your activities with beneficiaries. Reflecting on practices and experiences is a way to understand and know ourselves. Whilst thinking is essentially a cognitive activity, reflection involves also the emotional and physical dimension. Viewing issues from a different perspective challenges assumptions and preconceptions, encouraging the development of new views and opinions. The wheel below shows the different filters through which we process information. The most internal of the four layers of the wheel contains all our beliefs, values, likes and dislikes, which influence and are influenced by the other layers. Internal dimension. This dimension includes all those aspects of our self over which we have no control. These are all the things that we usually notice first in other people and on which we often base judgments. External dimension. These are all the aspects of our lives on which we have control over. These might change over time and usually form the base of our decisions related to work. Organisational dimension. This layer includes all those aspects that are influenced by the group or organisation where we work. 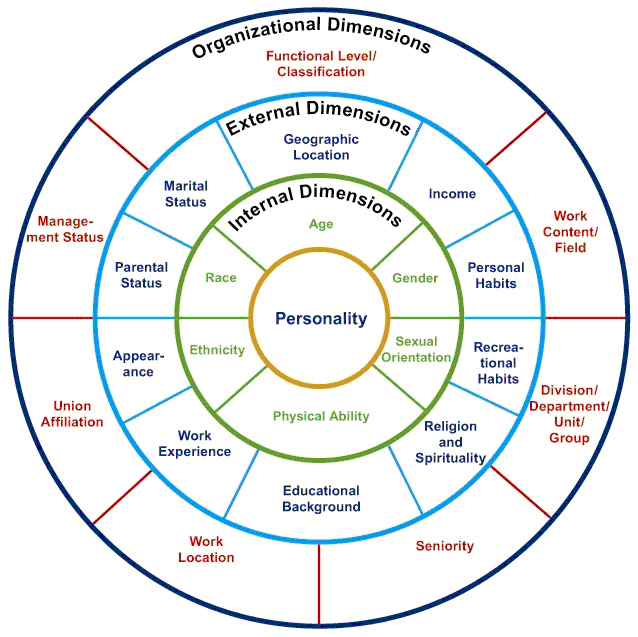 Keeping in mind the four dimensions of the diversity wheel, take some minutes to write some sentences to answer the question “Who I am?”. The only rule to follow is that each sentence starts with the words “I am…”. TIP: You can include statements about where you are from, what is your religious belief, memories, interests, favourite phrases, family traditions, whatever you deem important to define who you are. Once you have your sentences written down, read them again and try to answer these questions. If you were forced to leave you country and you life tomorrow, how would those sentence change? Before going to the next exercises, we encourage you to have a look at this video. This is a campaign produced in Denmark which provides some points for reflection. You can use it as a material to trigger/initiate debate with colleagues. If you use it with beneficiaries, please, be familiar with the material and be prepared to potentially share personal information. Remember a time when you felt especially included, engaged and appreciated in your personal or professional life. Recall a situation in which you felt especially excluded, alienated and invalidated. The aim of this reflection is to identify possible exclusion and inclusion features that have affected you. A term that is related to the perspective-taking process is empathy. Empathy is commonly defined as the ability to understand and share the feelings of another person. When promoting social inclusion, it is important to take the perspective of the other individual, but also to show empathy to the excluded person as it will help creating a trust relation with the beneficiary whilst also make it easier for you to identify possible solutions to the situation of exclusion. Try to give an answer to the following questions. What do the words difference, diversity and community mean to you? Discuss why difference and diversity might be important in a community. What do you think about when you feel different? What advice would you give to someone who feels different? ACTIVITY 4. How would you feel? Read the short stories in italic and take notes about your reaction on the situation. Then read the point for reflection and compare them to your own reaction. Mrs Fields handed back Monday’s math test. Jacob said, “Finn, how did you do?” “I got a B,” Finn replied. “I got a perfect score!” Jacob told him. “My first A plus! I studied all weekend. I bet my mom will take me for ice cream to celebrate.” “Stop bragging, Jacob!” Finn yelled. Finn thinks Jacob is bragging, but if he stopped to think about how he might feel in Jacob’s situation, what might he realize about how Jacob is feeling? When we try to understand other people’s feelings, we’re putting ourselves in that person’s shoes. If Finn was really listening to Jacob, he might have better understood that Jacob is proud to have gotten his first A+ after having studied all weekend. Ann thinks that Mandy is just being mean to her, but if she put herself in Mandy’s shoes she would realise that she would be angry as well if she ended up in trouble because of a mistake she didn’t do. Does John show Abi any understanding? What would have been a better way to talk to Abi? If John had thought about Abi’s feeling, maybe he would have treated him more nicely. Rima is annoyed by her friend who is acting silly. If had thought about Laura’s feelings about meeting her brother after a long time, she might have realised what was causing her “weird” behaviour. What could Valerie have rather done in this situation?